Time to sell your Beach Front condo? Read about today's resort-market condo buyer. 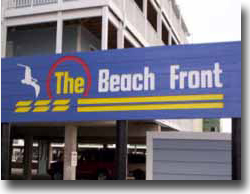 Beach Front is the name of a condominium in the West Beach area of downtown Gulf Shores. This page displays condos listed for sale in the Beach Front condominium. For more info on - all buildings that are direct gulf front - check out our gulf front section on our Gulf Shores condos for sale page. Beach Front condos are located in the West Beach area of Gulf Shores, Alabama. These condos are approximately two miles west of the intersection of Highway 59 and Beach Boulevard. Beach Front is comprised of 36 individual condo units built in 1982. Property amenities for Beach Front include a gazebo and BBQ area for family gatherings. Not all of the condos in Beach Front are direct gulf-front and many offer side views of the Gulf. Please let us know if you would like further info for Beach Front or any other condos, homes, or real estate along the Gulf Coast or would like to schedule a private viewing by emailing info@condoinvestment.com or by calling (251) Area-Pro (251-273-2776) for immediate assistance.